Photo #1 Mike Shebib (far left) from Health Care Relocations meets with MCH physicians and staff before the patient move begins. He briefs everyone on their different roles. On the day of the patient move, each person involved in the move will be wearing a different coloured t-shirt depending on their role for the day. Photo #2 (l. to r.) The mock patient move officially begins! 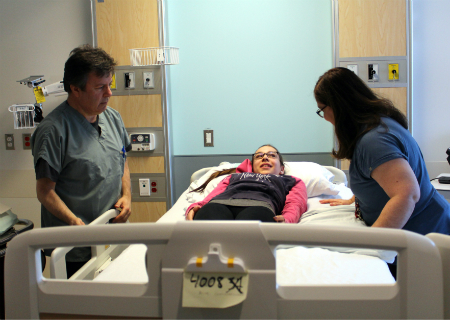 Carlo Galli, coordinator of the MCH Physiotherapy department, and Leonard Johnston from Housekeeping help move the “patient” – 14-year-old Annaëlle Leclair. Carlo will lead the Lift Team on patient move day. They will be responsible for lifting the patient from their bed and onto the stretcher. There will be two Lift Teams, one at 2300 Tupper and the other at the new Children’s on the Glen site. Each role at the Children’s will be mirrored at the Glen. Photo #3 The Lift Team gets help from Julie Grenier, the Unit Patient Sender on 6C, and Houssam Kalach, the Transfer RN. 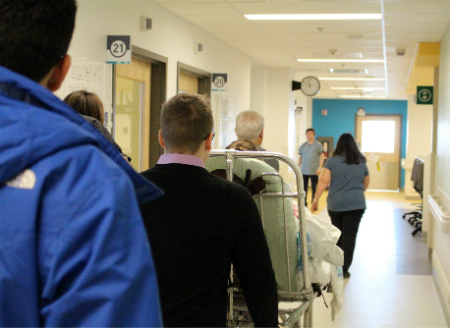 The Transfer RN remains by the child’s side during the entire move in order to provide continuous care along the way. In critical cases, a respiratory therapist and a physician will also be present. 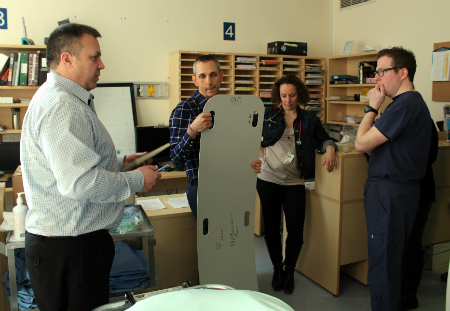 The Unit Patient Senders are responsible for coordinating the safe departure of patients from their floor. Each ward will have their own Unit Patient Sender. Annaëlle was also observed by Dr. Harley Eisman, the Global Patient Sender, before leaving the unit. 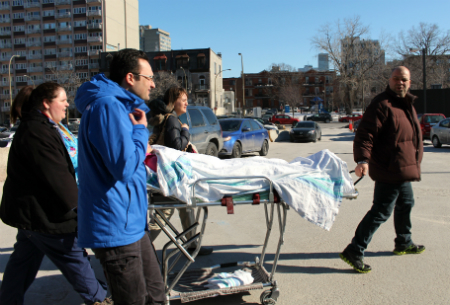 Photo #4 Annaëlle is then wheeled from her room to the elevator by the site Transport Team. On patient move day, a technician will be present to coordinate all the elevators in order to ensure the move runs as efficiently as possible. 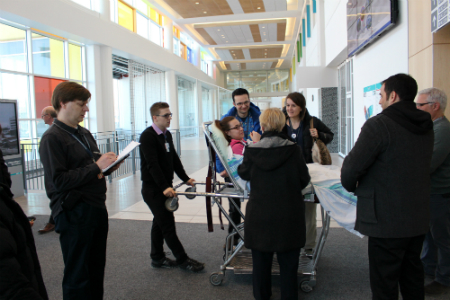 The Transport Team then wheels Annaëlle to the first floor in order to exit from the Emergency Department (ED). All patients will be exiting from the ED on patient move day. 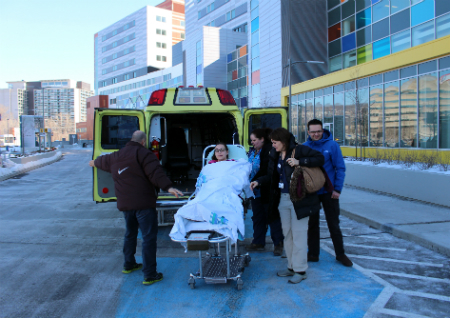 Photo #5 Annaëlle and her stepmom, Ann Hébert, are then met by ‘Urgences-Santé’ paramedics (which were played by MCH staff for the mock) at the door and brought to the ambulance. Before exiting the Children’s, Annaëlle was stopped by Riffat Mirza from Admitting. She checked her identity and then flagged her as a patient “in transit” to the Glen site. This step is important because it allows the Command Centre to know where the patient is at all times. 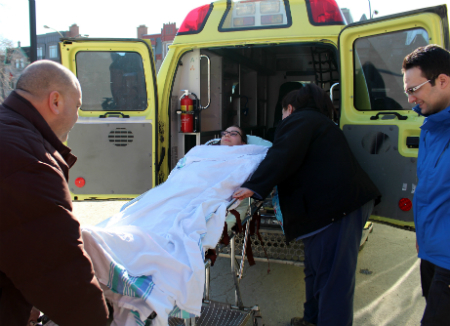 Photo #6 Annaëlle’s stretcher is loaded onto the ambulance. Since she is not a critically ill patient, her stepmother is allowed to ride along with her in the ambulance. On patient move day, one parent may ride in the ambulance with their child, except in critical cases. Parents of NICU and PICU patients will not be allowed to travel by ambulance. This is due to the large amount of equipment and personnel needed to transport their child safely. Photo #7 Annaëlle arrives safely at the Glen! Photo #8 Annaëlle and Ann are greeted at the front entrance of the new Montreal Children’s Hospital by the site Transport Team. They stop to talk to Lucy Caron, the Global Patient Receiver. She checks the child’s health status, and along with Admitting, verifies the patient’s identity and electronically admits her to the new hospital. They send Annaëlle to her new room on B9. 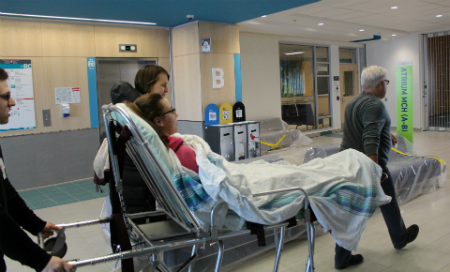 Photo #9 The patient is wheeled through Block B towards the Trauma elevators. All patients will be using these elevators on patient move day. Over 60 volunteers will also be present to help facilitate the move by opening doors and helping with wayfinding. Photo #10 We’re almost there! Annaëlle is greeted by Josie Revuelta, the Unit Patient Receiver, and is brought to her new room. The Unit Patient Receiver is the primary contact for the move teams as they arrive to the unit. The Unit Patient Receiver will direct the move teams to the patient room and have the assigned nursing staff in place to receive the report from the Transfer RN. 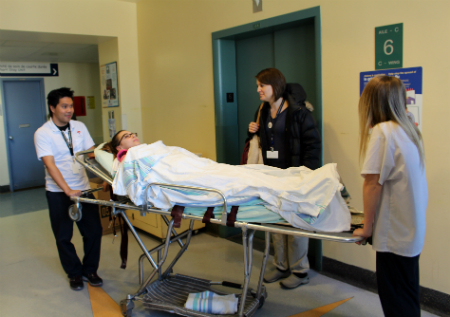 Photo #11 Josie helps the lift team moveAnnaëlle from her stretcher to her new bed. Photo #12 The mock move is over! From bed to bed, it only took the team 12 minutes. A second mock move happened on April 14. The team moved an infant and it took 15 minutes because they spent more time with Admitting at both sites, and the third one will happen on May 11. Besides the three official mock moves, units are also performing department-specific mocks to make sure their staff is prepared for the big day. 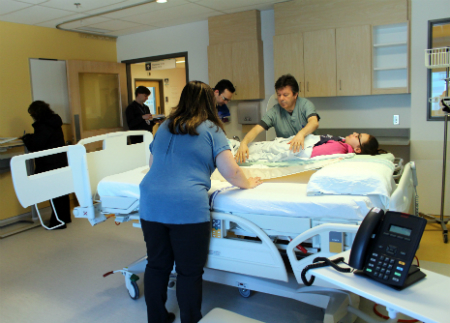 The Pediatric Intensive Care Unit successful completed their mock move on April 21.